Run by the team responsible for the immensely popular Snowdogs campaign which raised over £310,000 for the charity, the trail of 50 giant snail sculptures will take place across the streets of Brighton & Hove from 15 Sept to 18 November 2018. Shrigley's contribution will be sited outside Brighton Dome, on Church Street. Best known for his dark and funny drawings that comment on the absurdity of modern society, David Shrigley was nominated for the prestigious Turner Prize in 2013. Last year, he created Really Good - a seven-metre-high bronze sculpture of a thumbs-up - for Trafalgar Square's Fourth Plinth. "I'm very happy to participate in this project and to be able to help the wonderful work of the Martlets hospice." The trail of 50 giant snail sculptures, each uniquely decorated by an artist, will be on show for nine weeks, encouraging locals to be tourists in their own city and generating a giant snail sized 'feel-good' factor. The giant gastropods will be joined by a host of smaller snails as part of the Junior Snailway. More than 50 nurseries, schools and youth groups will decorate their own snails, which will be displayed in accessible locations across the city. At the end of the trail there will be a celebratory Farewell Event; a chance to see the snail sculptures together. Finally, the giant gastropods will be auctioned to raise money for Martlets and its life-changing care. 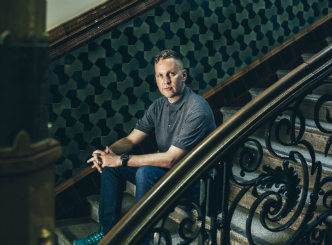 "We're delighted that David Shrigley is designing a snail for our Snailspace public art event and it is highly fitting that it will be displayed at Brighton Dome, in the year that he was Guest Director of the Brighton Festival. "We'd like to thank One Digital for sponsoring this snail and supporting our campaign which will ultimately help fund our life-changing care."